Sometimes I wonder if I know much of anything at all. @kev how are FW authors responsible for what the users are doing? A) How long does CreateProcess take on Windows? B) How long would you like it to take? A) You mean you can make it as fast as I want? I often find odd performance issues all on my own, but sometimes they are given to me. So it was when I returned from vacation to find that I’d been CCed on an interesting looking bug. Vivaldi had reported “Unit test performance much worse on Win10 than Win7”. unit_tests were taking 618 seconds on Win10, but just 125 seconds on Win7. By the time I looked at the bug it was suspected that CreateProcess running slowly was the problem. My first guess was that the problem was UserCrit lock contention caused by creating and destroying default GDI objects. Windows 10 made these operations far more expensive, I’d already written four blog posts about the issues that this causes, and it fit the symptoms adequately well. But! I don’t get paid to guess at the causes of problems, so I built Chromium’s unit_tests.exe, profiled it myself, and quickly found that my initial theory was completely wrong. unit_tests.exe runs about 10,900 tests. It creates child-process instances of itself to run them, with each child process running ten tests. That means it needs to create about 1,090 child processes. The child-process creation is multi-threaded, but serialized by a lock in order to control handle inheritance. 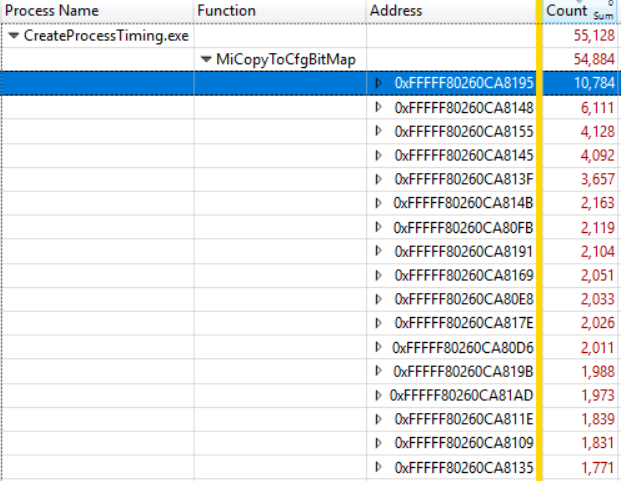 I verified by looking at CPU Usage (Precise) data in an ETW trace that the main process was spending huge amounts of time waiting on its lock around the CreateProcess calls. CFG is a security feature that uses a bitmap to track which indirect branch targets are valid and MiCopyToCfgBitMap was clearly initializing that bitmap. unit_tests.exe is a 122 MB executable and it has about 180,000 valid indirect branch targets but… computers are really fast. 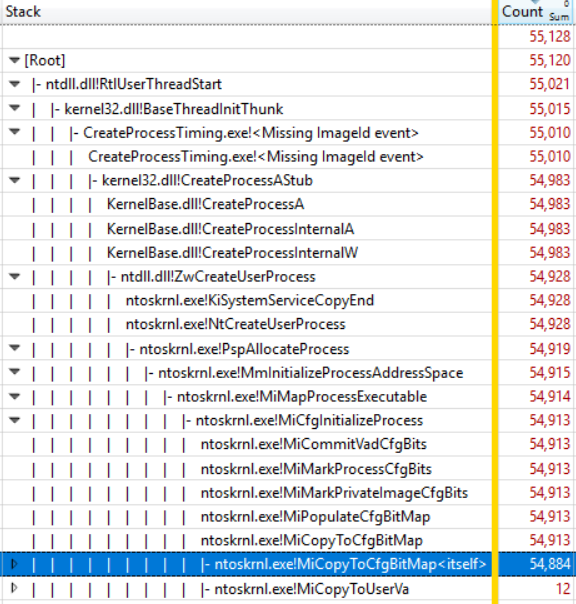 The CFG bitmap for unit_tests.exe is only about 1.5 MB and it’s hard to understand why it would take about 780 million clock cycles to initialize such a small amount of data. Since CFG is a security feature we want to leave it enabled for all of the executables that we ship. But we don’t actually need it for our tests. 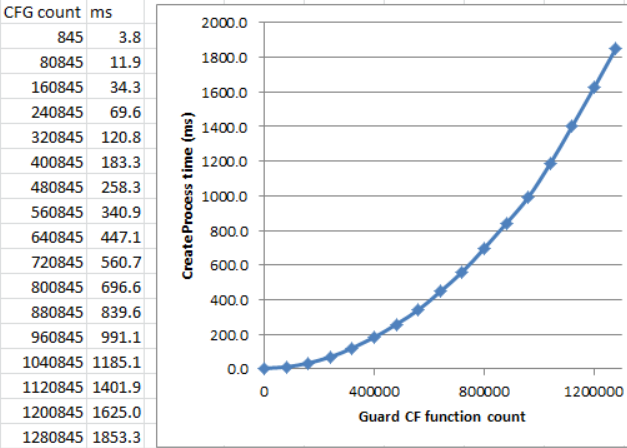 So, I landed a change that turns off CFG for our test binaries, and suddenly unit_tests.exe was running about five times faster, with CreateProcess itself now running about 20 times faster. Our other large test binaries also run a bit faster, but I didn’t spend much time measuring their improvements. My work here was done but I am a very curious bear and I wanted to better understand what was going on. I wanted to find out whether the problem was specific to Chromium (perhaps caused by our use of clang-cl or lld-link) and I wanted to try to understand why CFG was causing such a slowdown. My best theory for why MiCopyToCfgBitMap was so slow was that it was using an O(n^2) algorithm. That would explain why this performance issue had gone unnoticed by Microsoft, and it would explain why initializing such a small amount of data was taking so long. Ever since I wrote a “sooper-fast (TM)” version of std::vector (before std::vector existed) and found that it had abysmal performance due to my use of a linear growth strategy I have had a deep respect for the ability of O(n^2) algorithms to make fast computers run slowly. I don’t know what MiCopyToCfgBitMap is doing but it clearly has two nested loops, and can’t efficiently handle large executables. It may be that the algorithm is actually O(NumCfgFunctions * BinarySize) but the net result is the same. After creating the necessary gn file (build script) changes to turn off CFG for the test binaries I did one last test, to verify that my fix worked, and to revel in the joy of watching the tests run so much more smoothly. My revelry was cut short when several of the tests repeatedly timed out and my test run showed no signs of completing at all. It made no sense. I had done a clean run with my fix just a few minutes before, I’d made no code changes, and now I was seeing a new and different form of pathological test performance. WTF! I grabbed another ETW trace and quickly found that some of the tests were spending 60+ seconds calculating the size of a directory. The current directory. Previously I had run the tests from the output directory, and this scan would take about 4 seconds – fast enough that I didn’t notice it. For some reason on the last test run I had run the test from the Chromium source directory and that directory takes much longer to fully scan. With that realization I was able to get the clean test run that I wanted (I went back to running from the output directory) and I then filed a bug for the tests with the bogus directory scanning. They are supposed to be testing the behavior of the AppInfoSummaryPanel, this panel includes a display of the size of the app, and the test never specified what directory should be scanned. This bug costs a few seconds every time unit_tests is run, and occasionally costs a lot more, but it should be easy to fix. Sometimes the most important piece of information is just the knowledge that a piece of code runs faster in one environment than the other, or some other clue that improvement is possible. As soon as Vivaldi pointed out that unit_tests.exe ran slower on Windows 10 than on Windows 7 a solution was inevitable. Microsoft has been notified and I assume that they will investigate, and fix the issue if possible. There is no sign that this affects Chrome itself because only large .exe files are affected. This post is sort of a continuation of an ongoing series about making Windows slower.